Beer Scented Candle Hazelnut Pale Ale. 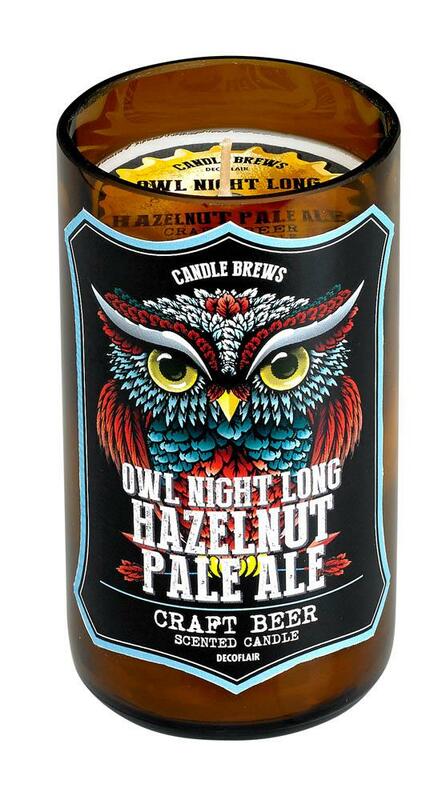 The Owl Night Long Hazelnut Pale Ale candle is a great gift for any beer lover, offering dark good looks and a nutmeg and orange-centered scent. This candle beats a nightcap! The unique Hazelnut Pale Ale scent opens with nutty nutmeg and orange before delicious heart is blended together with rich chocolate, butter, cherry and roasted hazelnut. All undercut with green hops and clove. Burn time: up to 50 hours. 2.75" x 2.75" x 5" Soy blended wax.